Stockbridge Community News – Page 193 – A nonprofit newsletter for the common good and welfare of residents in the Stockbridge, Gregory, Munith and Fitchburg area. Kindergarten and Young 5’s Roundup. Stockbridge Schools. Meet Your Unadilla Twp. Fire Dept. Euchre Nights, January 6th and 20th at 7pm. Bunco will be on Saturday, January 13th at 6:30pm. Dansville Community Center, 1317 Mason Street, Dansville. Donation for $5. Prizes! Info: 517-521-4547. Do you like to play Euchre or Bunco? The Dansville Community Center at 1317 Mason Street in Dansville will be having Euchre Night on Saturday, January 6th and 20th starting at 7pm and Bunco on Saturday, January 13th at 6:30pm. A donation of $5 per person is asked to help pay for expenses for the night. Prizes will be awarded. Beginners are welcome. For more information contact 517-521-4547. In support of Milk Means More, the rock & roll nutrition show Jump with Jill is pleased to announce that 35 Michigan schools have been awarded the show by Michigan’s Dairy Farmers in partnership with the United Dairy Industry of Michigan (UDIM). Now in its fifth year, the partnership has reached 167,539 students. Jump with Jill uses music and dance to celebrate healthy habits by transforming nutrition education into a live concert. Created by a Registered Dietitian and professional musician, Jump with Jill is both educationally sound and completely rock & roll. Behaviorally-focused and research-proven, the show creates a world where healthy is not just an important thing to do, but the cool thing to do. 1/9/2018 North Aurelius Elementary – Mason, MI 2:30 – 3:30 p.m.
1/16/2018 Smith Elementary – Stockbridge, MI 9:30 – 10:30 a.m.
1/16/2018 Schavey Road Elementary – DeWitt, MI 2:15 – 3:15 p.m.
1/17/2018 Dansville Elementary – Dansville, MI 1:45 – 2:45 p.m.
Why: Inspire students to make healthy choices for themselves. American Red Cross Blood Drive, Thurs., January 11, at Stockbridge Presbyterian Church. 1 p.m. until 6:45 p.m. Please contact the Red Cross at 1-800 448-3543 to schedule an appointment and obtain a rapid pass to speed the donation process. Vendors and Soups will be the scene at the Presbyterian Church Community Building this Saturday, Jan. 13. from 11 a.m. to 3 p.m. 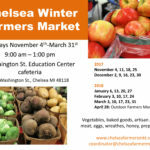 Patrons are invited to visit our vendor booths of the Open Air Market brought indoors. Bunco will be on Saturday, January 13th at 6:30pm. Dansville Community Center, 1317 Mason Street, Dansville. Donation for $5. Prizes! Info: 517-521-4547.
the fluffy stuff from the sky. Snowman craft included. Tuesday, Jan. 16 • 12:15–1 p.m.
*Kitchen Magic with Ming Chef Ming Louie shares recipes, entertaining cultural anecdotes and more in these hands-on presentations, funded by the Stockbridge Friends. Selected Wednesdays • 4–5 p.m. Jan. 17: Oyster sauce beef with rice stick noodles to eat here. Jan. 24: Chinese/Italian Bolognese meat sauce to take home. *Events marked with an asterisk require registration by calling 517-851–7810. in these hands-on presentations, funded by the Stockbridge Friends. Selected Wednesdays • 4–5 p.m.
Jan. 17: Oyster sauce beef with rice stick noodles to eat here. Jan. 24: Chinese/Italian Bolognese meat sauce to take home. Stockbridge High School Jazz Band Come out to support our local student-musicians Thursday, Jan. 18 • 7–7:45 p.m.
Thursday, Jan. 18 • 7–7:45 p.m.
Mindfulness Matters Kathy Walz, a behavioral health professional with St. Joseph Mercy Chelsea, presents some essential aspects of mindfulness and tips for incorporating it into your life. Learn strategies for reducing stress and staying present in the current moment. Tuesday, Jan. 30 • 4:30–5:30 p.m.
some essential aspects of mindfulness and tips for incorporating it into your life. Learn strategies for reducing stress and staying present in the current moment. Tuesday, Jan. 30 • 4:30–5:30 p.m.